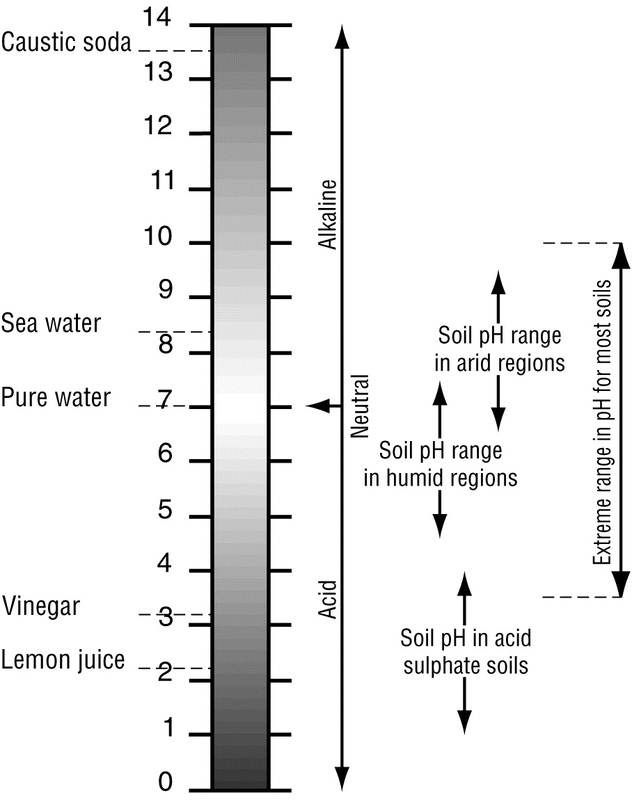 Soils can be naturally acid or alkaline, and this can be measured by testing their pH value. Having the correct pH is important for healthy plant growth. Being aware of the long-term effects of different soil management practices on soil pH is also important. Research has demonstrated that some agricultural practices significantly alter soil pH. Soil pH is a measure of the acidity or alkalinity of the soil. A pH value is actually a measure of hydrogen ion concentration. Because hydrogen ion concentration varies over a wide range, a logarithmic scale (pH) is used: for a pH decrease of 1, the acidity increases by a factor of 10. 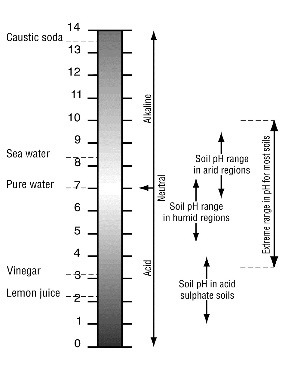 It is a ‘reverse’ scale in that a very acid soil has a low pH and a high hydrogen ion concentration. Therefore, at high (alkaline) pH values, the hydrogen ion concentration is low. Most soils have pH values between 3.5 and 10. In higher rainfall areas the natural pH of soils typically ranges from 5 to 7, while in drier areas the range is 6.5 to 9.
less than 6.5—acidic, and soils with pH less than 5.5 are considered strongly acidic. Acid sulfate soils can have extremely acidic pH values (pH less than 4). Natural soil pH depends on the rock from which the soil was formed (parent material) and the weathering processes that acted on it—for example climate, vegetation, topography and time. These processes tend to cause a lowering of pH (increase in acidity) over time. Some agricultural activities can also accelerate the acidification process. Soil pH affects the amount of nutrients and chemicals that are soluble in soil water, and therefore the amount of nutrients available to plants. Some nutrients are more available under acid conditions while others are more available under alkaline conditions. However, most mineral nutrients are readily available to plants when soil pH is near neutral. low levels of essential plant nutrients such as phosphorus and molybdenum. Alkaline soils may have problems with deficiencies of nutrients such as zinc, copper, boron and manganese. Soils with an extremely alkaline pH (greater than 9) are likely to have high levels of sodium. The correct balance is where the soil pH is between 5.5 and 7.5, so every effort should be taken to check soil pH levels regularly. Early identification of soil pH problems is important as it can be both costly and difficult to correct long-term nutrient deficiencies. Some fertilisers can change soil pH and increase or reduce the amount of nutrients available to plants. Fertilisers such as crushed sulfur and some ammonium-based nitrogen fertilisers lower pH and make soil more acid. They are, therefore, useful for soils with problems caused by high pH. When soils are too acidic for a particular crop, lime or dolomite can be used to increase the pH to the desired level. The amount of lime or dolomite required to correct an acidic pH will vary from soil to soil. Soils with high organic matter and clay content will be more resistant to changes in pH and will require larger application rates. Therefore soil pH, while indicating the need for lime, is not a reliable guide as to how much lime is required. Field trials, in which good quality lime was cultivated into the soil surface to a depth of 0.1m, have been undertaken on a number of acidic soils in Queensland. Across all soils, for every tonne of lime added per hectare, soil pH increased from 0.1 to 0.8 pH units. The most common change was an increase of 0.2 to 0.3 pH units. The larger pH increases were obtained on sandy soils with low organic matter content. Typical commercial application rates of around 2 tonnes of lime per hectare are therefore likely to increase the pH by only about 0.5 of a pH unit. However, these small pH increases are often enough to result in an increased yield. Liming tropical and subtropical acidic soils usually results in an increase in their capacity to hold nutrients. This is a benefit that is not often realised. Inexpensive and easy-to-use field kits are available to measure soil pH—these provide only an approximate soil pH value. Laboratory testing is required to obtain an accurate pH value. Most Queensland laboratories use a 1:5 (soil:water) suspension method to determine pH. However, some laboratories may use different testing methods, so professional advice should be sought when interpreting test results and planning management strategies.